July | 2014 | Carla Cassidy Books - Don't Turn Out The Lights! I have neglected posting here for a while – focusing on wellness and health. I have three chemo treatments and one small surgery left and then I’m finished! During this whole ordeal, I’ve discovered what I’ve missed the most…having truly productive days of writing, going out anywhere and visiting with friends. I took my first trip to the grocery store last week and I was so excited to be out and see people. I’m still bald, but have a variety of hats, sparkly pink and black with bling, what else does a girl need?? 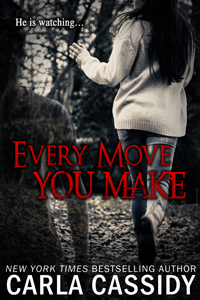 I have a new reprint to announce – Every Move You Make is now out on Kindle for the first time. It’s a big romantic suspense. I’m working on books for both Harlequin Intrigue and Harlequin Romantic Suspense, keeping busy taking naps between words. For anyone who has asked, the last of the Men of Wolf Creek books is out – Lone Wolf. Others have asked about my Return to series with Intrigue. Return to Bachelor Moon, Return to Mystic Lake are already out and the last of the series will be out in Oct. Hope you all enjoy them. That’s it from me for now. Thanks for stopping by!